Even with the most attentive tree care practices, eventually most homeowners find they need to call a tree removal service. While some people might try to avoid paying professional tree costs by doing their own tree cutting and tree removal, safety experts highly recommend hiring a tree service contractor due to the risks involved in working with hazard trees. As a locally owned tree service company, every member of our team at Landmarq Tree Service understands the family budgets are tight, so we do everything possible to keep tree removal costs as low as possible, while maintaining our high standards of excellence. To learn more about our tree removal service in Pompton Plains NJ, contact the trusted tree removal experts at Landmarq Tree Services by calling (973) 552-2041 today! Experts consider trees as hazardous if they cause a serious risk to property or people. According to OSHA, more than 100 people die from tree related incidents each year. Many homeowners do not realize they are liable for the expense of personal injuries or property damage caused by hazard tree on their property. In fact, many homeowner insurance carriers deny claims for injuries and/or property damage if they determine the policyholder knew the tree was at risk of failure and did not arrange for tree removal services. Given the high expense associated with personal injuries and property damage, which can potentially cost hundreds of thousands of dollars, tree removal costs seem low in comparison. If you are not sure if a tree on your property is dangerous, experts recommend arranging a professional tree inspection by a reputable tree service contractor like Landmarq Tree Service. Call (973) 552-2041 to schedule a free tree inspection with the leading tree service company in Essex County NJ and surrounding communities – Landmarq Tree Services. Since many otherwise healthy trees become catastrophically damaged during severe storms, Landmarq Tree Service offers 24-hour emergency tree removal Pompton Plains NJ and the rest of the local area. 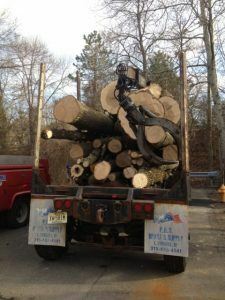 Landmarq Tree Service offers homeowners complete and reasonably priced solutions for tree removal in Morris County NJ, Bergen County NJ, Essex County NJ, Sussex County NJ, and Passaic County, NJ.